The National Building Museum is America’s leading cultural institution devoted to interpreting the history and impact of the built environment by telling the stories of architecture, engineering, and design. 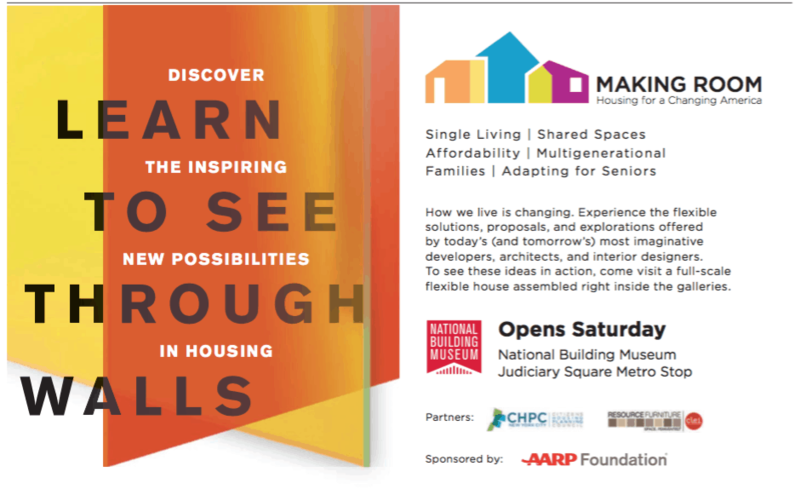 The National Building Museum needed to get the word out about their newest exhibit, “Making Room,” which explored the various housing needs of today’s growing but underserved households. The exhibit featured a 1,000-square-foot home with a hyper-efficient layout, movable walls, and multifunctional furniture. The National Building Museum engaged Proof Strategies for support in developing and executing an integrated communications plan to increase awareness of and attendance at their new exhibition. In addition to media relations, Proof incorporated original creative into the campaign by designing an advertisement to feature in DC metro stations. Proof’s pitching resulted in a total of 75 placements in key publications, including The Washington Post and Washingtonian. Overall, these placements amounted to a reach of 131.08 million people, and numerous reporters attended the exclusive press preview. The advertisement was digitally displayed in metro stations with high traffic throughout the DC-metro area.